Summon Storm Atronach: Duration: [18 / 19 / 20 / 21] seconds. Summon an immobile storm atronach at the target location. Its arrival deals 6149 Shock Damage and stuns enemies for 3 seconds. The atronach zaps the closest enemy, dealing 3073 Shock Damage every 1 second. An ally near the atronach can activate the ​ Charged Lightning synergy, granting the ally and the atronach Major Berserk, increasing their damage done by 25% for 8 seconds. Greater Storm Atronach: Duration: [25 / 26 / 27 / 28] seconds. Summon Charged Atronach: Summon an immobile storm atronach at the target location. Its arrival deals [6149 / 6217 / 6285 / 6352] Shock Damage and stuns enemies for 3 seconds. The atronach zaps the closest enemy, dealing 3073 Shock Damage every 1 second, and periodically deals 6149 Shock Damage to enemies around it. An ally near the atronach can activate the ​ Charged Lightning synergy, granting the ally and the atronach Major Berserk, increasing their damage done by 25% for 8 seconds. Summon Storm Atronach summons a Summoned Storm Atronach familiar to aid you in battle. The familiar lasts for a short time, and cannot move. It deals Shock Damage and stuns all enemies within its casting radius when initially summoned, then continues to attack the nearest target until it is killed or the duration expires. In addition, your allies may activate the ​ Charged Lightning synergy, increasing both their and the Atronach's damage output by 25% fo 8 seconds. 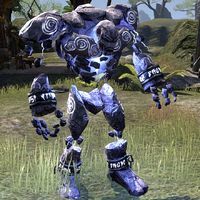 The Greater Storm Atronach morph summons a Greater Storm Atronach lasts longer and does more damage, while the Charged Atronach created by the Summon Charged Atronach morph attacks multiple targets at once. Greater Storm Atronach is a recommended morph for the Sorcerer Initiate build. The storm atronach summoned by this ability now increases in damage as the ability ranks up. The Charged Lightning synergy associated with this ability now adds 150% bonus damage instead of a flat 150 damage. The Charged Synergy is now instant and provides both you and the Atronach the buff Major Berserk for 8 seconds. This Synergy is available to other player characters within 2.5 yards of the Atronach until one player character triggers it. The Greater Atronach now does 15% more damage as compared to the normal Storm Atronach. Fixed an issue where this ability was only scaling off your magicka stats, but not your stamina stats. It will now correctly pick the largest value. Increased the damage dealt from the pet summoned by this ability and its morphs by approximately 25%. Your summoned pets will now focus on attacking the target you heavy attack. Summon Shade, Summon Storm Atronach, and Maw of the Infernal Item Set have been added to this list of pets that obey your commands. Fixed an issue where the Atronach summoned from this ability and its morphs could use its channeled zap attack through walls. Summon Charged Atronach: The Atronach summoned by this morph will now use one large, point blank area of effect attack instead of five small circular damage zones around it. This should improve the reliability of it hitting targets with that attack. Increased the health of the Atronach summoned by this ability and the Charged Atronach morph by approximately 70%.